“Don’t believe everything you hear about the drone program. I know what I’m talking about,” read a sheet of paper that an anonymous woman held up to conceal her face as she posed for a photograph, upon which Sonia Kennebeck, SIS/MA ’04, would eventually stumble. After some detective work on Facebook helped Kennebeck identify the woman in the photo as Heather, a US military veteran, Kennebeck finally had the source she needed to begin shooting her first feature-length documentary film, National Bird. Kennebeck’s film made its world and US premieres last year at the renowned Berlin International Film and Tribeca Film festivals, respectively, and will make its way around the US for a series of free community screenings this spring before airing May 1 on PBS. National Bird provides unique insights on the US’s secretive and controversial military use of unmanned aerial vehicles, known as drones, through the humanizing perspectives of three veterans and whistleblowers: Heather, a former imagery analyst; Daniel, a former signals intelligence analyst; and Lisa, a former technical sergeant on the drone surveillance system. The three describe their involvement in drone wars and strikes in the Middle East, revealing troubling issues such as veteran suicide, civilian casualties, and government technology and surveillance that have shrouded the drone program in mystery for years. While the first half of the film explains the technology, use, and history of drones as a military tool, the second half of the film takes an emotional turn as the protagonists’ personal stories and struggles with guilt, reconciliation, and acceptance unfold. The film, Kennebeck hopes, will serve not only as platform to share these personal stories of war—of the military members who must decide whether someone thousands of miles away is holding a shovel or a weapon and of the innocent civilians in war-torn countries who have been used as human shields in the drone strikes—but also hopes it will be a tool and springboard for informed conversations about the future of drone wars. “This is a new technology and it’s creating a lot of issues in how it complies with international laws, rules, and regulations. It is one instance in which technology has outpaced our laws, which were not written with this type of technology in mind. We have to catch up,” Kennebeck says. In years prior to the film, Kennebeck creatively combined her talent behind the camera with her international affairs background to cover international, political, and military stories as a freelance producer. Originally, she intended for her drone research to be a shorter broadcast documentary, but realized as she dove deeper into the subject that it had to grow into a larger feature-length film—a first for her. To continue with the project, Kennebeck had to secure funding and an attorney. She also found two top-notch executive producers: Academy Award-nominated Wim Wenders and Academy Award-winning Errol Morris. With no prior connection to either Wenders or Morris, she was pleasantly surprised to be granted a 30-minute appointment with Wenders, which concluded with him agreeing to be an executive producer on the film. Armed with the tools she needed to pull off the film, Kennebeck and her small crew shot in New York, San Francisco, and Pennsylvania, as well as in Afghanistan, where she and US veteran Lisa met with Afghan victims, survivors, and family members who lost loved ones in drone strikes. “It’s very, very moving. Audience members expect that the civilians who have been targeted or who have lost limbs will be angry. But there is no anger. You see it in the film that the Afghan families are just so peaceful—there’s not a single trace of anger. The only thing that they ask is that the US please stop killing civilians with drones. In a way, it has almost an optimistic ending because there is hope for reconciliation,” she says. 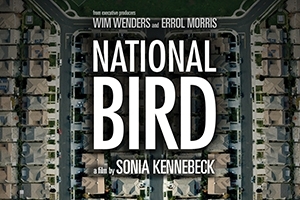 Watch Kennebeck’s National Bird in full at 10:00 p.m., May 1, on PBS, or attend a local screening near you.